Dry White Wine, Muscat of Alexandria, P.D.O. Aromatic gold-yellow colored grapes. The “Muscat of Alexandria” variety is cultivated in the island since 1920, on rich red soil at an altitude of 200-250 meters above sea level. Muscat of Alexandria (or English, or Zibbibo) is practically a monoculture for Limnos, and it is traditionally used as triple use variety for wine-making, raisin production and as a table variety. Muscat cultivation becomes intensified from 1922 onwards, when refugees from Asia Minor – who were also experienced winemakers – arrived to the island. Today, this particular variety covers almost the entire grape production in Limnos, in mostly organic vineyards. It represents one of the most actively emerging labels of Greek winemaking labels, thanks to its divine shining goldish color and fruity aroma which are an excellent accompaniment to fishes and selections of local cheeses. The French dehydrate their grapes on straws, while the Germans produce ice wine through concentration, by utilizing cold temperature. However, Mediterranean people opted for other ways to produce sweet dessert wine. In Greece, things are different. In our islands, people selected whatever was available in high quantity: waterless land and rich, hot sun. The sweet wines of Limnos are produced through the following manual and natural method: Wines are produced by overripe grapes or grapes containing a lot of sugars. These wines are also called “Naturally Sweet Wines” (vins naturellement doux) due to the reason that fermentation is naturally interrupted. The aromatic white “Muscat of Alexandria” variety from the vineyards of Limnos offers sweet P.D.O. wines that compete, in equal terms as regards taste and finesse, both Italian aperetivi and French vins de liquer. Nevertheless, they hide something that sets them apart from the other desserts of the global vineyard: That sweetness typical of the ripe grape, colored like old gold, basking and drying in the Aegean breeze under the sun of the Mediterranean. These are sweet wines with a high alcohol content, very flavorful, that can be consumed as an iced aperitif (at a temperature of 8-10 Celsius degrees), as a dessert after a dinner, or as an exquisite liqueur. Try these selected wines from overripe basked grapes, from the oldest selected vineyards of the island, with buoyant aromas from citrus confit, to pair them with yellow fruits, white sweets, dried fruits and pieces of dark chocolate. Limnio Dry Red Wine, P.D.O. Limnio is one of the oldest grape varieties in the world – if not the oldest. This Greek indigenous variety was the first variety cultivated in the island, dating back to ancient times according to references of historians and references found in Herodotus and Homer. 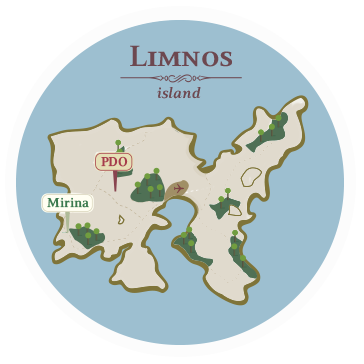 It has been suggested that Limnio originates from the Lemnia grape mentioned by Hesiod and Aristotle. It is worth noting that despite the fact that this variety is known as Limnio, it is called Kalabaki by the people of Limnos. This is a highly resistant variety when it comes to diseases and drought – this is, after all, the reason it has maintained its presence throughout the centuries. With the proper wine-making process, this variety can give red and rosé wins of high quality. In Limnos, this variety is used to produce red elegant wines with rich aroma and mild tannins that are excellent as an accompaniment to meat and cooked dishes. Its grapes are small to medium-sized, densely clustered, with a cylindrical or conical shape. Blue-black grapes, small sized and spherical. The skin is medium-thick, and the flesh is soft, colorless and juicy. Limnio is cultivated in mildly unfertile sandy soil, at an altitude ranging from 50 meters (Physini area) to 300 meters (Sardes area) above sea level with equally excellent results. It adjusts well to most soils, although it prefers dry, infertile, rocky soils. It begins sprouting during the first fifteen days of April and matures by mid-September. Each fruit-bearing vine contains 2-3 moderate grapes, approximately 250 g., of cylindrical to cylindroconical shape, very densely clustered and very hard to cut.